trunature Digestive Probiotic is a gluten-, dairy- and soy-free probiotic supplement containing 10 billion CFU per capsule of 2 strains of beneficial bacteria. This is not made by the same company called “TruNature” at trunature.net. What Probiotic Strains are in trunature Digestive Probiotic? This probiotic supplement contains 2 probiotics: Lactobacillus acidophilus and Bifidobacterium lactis in a proprietary mix. The exact strains are unknown. 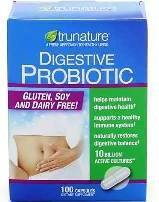 What are the Other Ingredients in trunature Digestive Probiotic? The other ingredients at the time of this writing (April, 2015) are cellulose, silicon dioxide, magnesium stearate (vegetable source) and titanium dioxide. Please verify ingredients of any supplement prior to taking it. Apparently this product used to have prebiotic FOS in it, but that is not in the current formulation. As a dietary supplement for the claims described above for adults and children 2 years of age or older, the package recommendations are to take one (1) capsule at the same time each day, with or without food. The capsule is not supposed to be crushed or chewed, but if you are unable to swallow the capsule you open the capsule and mix contents into a cool drink or food. This probiotic supplement, like many, should not be added to warm or hot foods. What are the Pros of trunature Digestive Probiotic? It contains more than one species of probiotic. It contains one Lactobacillus acidophilus and one Bifidobacterium lactis, so depending on the actual amounts in the product, you can reasonably expect that this product will have some effects on digestive and immune health. In particular, the lactis strain may help with constipation and diarrhea, and some reviews have stated improvement with those. Please read the relevant pages on the effects of those two probiotics. It contains NO gluten, dairy or soy, nor does it contain animal products. Most of the other ingredients are mainly to keep the active ingredients from clumping and make it easier to capsulize them. Capsules are individually blister-packed to protect against heat, light and moisture. Inexpensive compared to some other probiotic supplements. No refrigeration is necessary if kept at or below room temperature. I recommend that you refrigerate probiotics, unless the label specifically says not to, in order to extend the viability of the microbes. “I was desperate for relief from terrible gas pains, constipation and other GI issues. I have been taking this for a week and the difference is incredible! I will continue to use this." "...For someone who suffered a number of years, with the highly aggravating condition known as constipation, these well sealed product deliver every day a very easy appointment with the thunder bucket..."
What are the Cons of trunature Digestive Probiotic? The total CFU is at the time of manufacture, not at expiration, so you don't know how much you are getting when you take it. The label says that it provides “an effective level” until at least the expiration date. Exactly what is meant by “an effective level” is not clear. One review by LabDoor.com showed that the product they tested contained 31 billion CFU. Fluctuations of intake between 10 billion and 31 billion could cause reactions in some people. Titanium dioxide is an inorganic compound usually used to make products such as paint, plastics, toothpastes, sunscreens and yes, some supplements, appear very white. Do you need to be ingesting it? It is a questionable ingredient according to NaturalNews.com and when inhaled, it is classified as a possible carcinogen (cancer-causing agent). No studies with this supplement as a whole supplement have been performed to my knowledge. Note that this is not unusual, however. Very few multi-species probiotic supplements are used in studies. Instead, species and strain that are show to be effective and non-competing are mixed together in most multi-species supplements such as this one. Compared to other multi-species probiotic supplements, this one contains a lower number of total CFU of 10 billion per capsule and only 2 strains. Although the product is said to be “produced under the strict manufacturing standards of US Food and Drug Administration”, there is no mention of third-party verification of either the supplies or the finished product to insure that the product is as pure as possible and that the potency is verified. Where to Find trunature Digestive Probiotic? This supplement is mainly marketed and sold through Costco retailers and at Costco.com. The details are supplied by the manufacturer and only hosted by Costco. Is trunature Digestive Probiotic the Right Supplement for YOU? Perhaps you can read the reviews I posted above and other reviews and see if those users had circumstances similar to yours. It is a low potency supplement, has "safe" species of Lactobacillus and Bifidobacterium, is free of most allergens and is packaged securely. If you need help in determining the probiotic, diet and lifestyle factors which may benefit your life, consider nutritional consultations. Thanks to Ruth for suggesting a review of this supplement!